As South Africa grapples with arguably its deepest economic crisis of the democratic era, two names have become a magnet for anger over the direction the country is taking. File Photo. President Jacob Zuma , Atul Gupta and Eastern Cape Premier Noxolo Kieviet at a New Age Breakfast in Port Elizabeth. www.flickr.com. One is that of Jacob Zuma, the president whose seven years in office have been characterised by scandals against a backdrop of tepid growth and mounting concerns about corruption and cronyism. The other name is Gupta, a family with close ties to Mr Zuma, who run a multibillion-rand business empire stretching from mining to IT and media. In many South Africans’ minds the two have become inextricably linked. To detractors, theirs is a relationship that has seen the Guptas, who are originally from the Indian state of Uttar Pradesh, hold undue sway over government decisions in Africa’s most industrialised nation, amid allegations that their political connections have allowed their business to profit from favouritism in state-related contracts. The claim is that under Mr Zuma’s watch, predatory networks of patronage and cronyism are effectively looting the state, with the phrase “state capture” now part of the South African lexicon. And as scrutiny on their interests and role mounts, the Guptas are increasingly portrayed as a symbol of the malaise afflicting the nation. They have been accused of overstepping the mark in a range of areas, from wielding influence over state officials and appointments, to using their connections to win government contracts. The allegations – none of which is proven – have proliferated amid battles for power inside the faction-plagued ruling African National Congress and the government. In separate interviews with the Financial Times, Mr Zuma and Ajay Gupta defended their relationship, denying the family had any influence over politics or had benefited unduly from their relations. “We are business people and we have nothing to do with politics,” says Mr Gupta, in a rare interview. The eldest of three brothers who run the family’s empire, he says only 1 percent of the more than R5bn ($325m) annual revenue generated from their businesses is derived from government contracts. Since Mr Zuma’s decision in December to replace his finance minister, Nhlanhla Nene, with a little-known backbencher, David van Rooyen, the scrutiny on the Guptas’ role has intensified. The debacle – Mr Zuma was forced to replace two finance ministers in four days – triggered one of the deepest political and economic crises in two decades, with speculation that Mr Zuma and his allies wanted a more pliable hand managing the state’s purse strings. Mr Nene is said to have resisted Mr Zuma’s plans for the government to build nuclear plants that many believe the country cannot afford, as well as attempts by the board of the lossmaking state carrier, South African Airways, to renegotiate a deal with Airbus. Floyd Shivambu, deputy leader of the Economic Freedom Fighters, a breakaway group from the ANC, wrote at the time that Mr Nene “was removed to open space for the Gupta-led syndicate to loot state resources for private enrichment”. It is not, however, just the opposition that has raised questions about the Gupta’s influence. A former senior state official confirmed that, in 2011, the country’s three chiefs of intelligence agreed that the family should be investigated as reports of their influence surfaced. But the security ministry quashed the idea within 24 hours, the person says. “If there’s state capture, it goes to the heart of national security,” the former official says. All three intelligence chiefs later resigned. Two years on from those events the intelligence bosses’ fears seemed to be borne out when a chartered aircraft carrying passengers from India to a Gupta family wedding landed at Waterkloof Air Force base in April 2013, prompting a national scandal and raising the profile of the family. A government inquiry later said the affair was deemed a “national security incident”, as the air base was exclusively for the use of military flights and heads of state. It concluded that the “activities of some of the persons involved were driven by the undesirable practice of undue influence and abuse of higher office”. It reported that officials invoked the president’s name, either directly or referring to “Number One”, as pressure was applied for the aircraft to be allowed to use the air base. A meeting of senior ANC officials in January said the party needed to “deal decisively with the threat of state capture”, a phenomenon where state contracts are divvied up among a cabal of politicians and businessmen. Zweli Mkhize, a senior ANC official, says the message was not aimed at one group or individual, but rather as a warning to “elected leaders to be conscious not to succumb to any demands from any interest groups. I wouldn’t personalise it on the Guptas, I would say it’s general,” he says. Mr Zuma insists there was no outside influence on his decision to replace Mr Nene with Mr Van Rooyen – a move he reversed four days later under ANC pressure as he reappointed Pravin Gordhan as finance minister. He defends Mr Van Rooyen’s appointment as a “well thought out decision”. The Guptas trace their roots in South Africa to 1993, when Atul Gupta, one of the three brothers, first visited the country. He decided to return to open a shoe shop in Johannesburg. His brothers, Rajesh and Ajay, followed and in 1997 the family – which already had business interests in India – established Sahara Computers. It has since expanded its interests across mining, property and the media, with the launch of the pro-government New Age newspaper in 2010 and a TV news channel. Ajay Gupta puts the success down to “hardworking people” but questions remain about where the family got the money to expand its business empire. 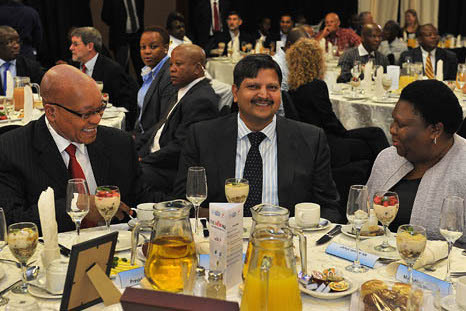 Its two main holding companies, Sahara Holdings and Oakbay Investments, generated revenue of R1.35bn and R3.6bn respectively in the 12 months to the end of February 2015, the Guptas say. Duduzane Zuma, once a trainee at Sahara Computers, has direct or indirect holdings in several Gupta-controlled entities. These include Infinity Media, the holding company for the TV channel ANN7, and Tegeta Exploration & Resources, a mining company. “We realised we had a good synergy and he [Duduzane] is a young man, he really worked . . . so . . . we said, ‘OK, let’s stick together,” Mr Gupta says. He adds that the family “maybe” provided the younger Mr Zuma “a very small loan” in the form of vendor financing, as is common in South Africa when businesses look to bring in black partners to meet targets on black participation in the economy. The mineral resources department and Oakbay deny the allegations. The company says it sought, and failed, to buy two other mines. “Despite our perceived influence and power, we got knocked out in the first round in two of those [bids],” says Nazeem Howa, chief executive of Oakbay Investments. 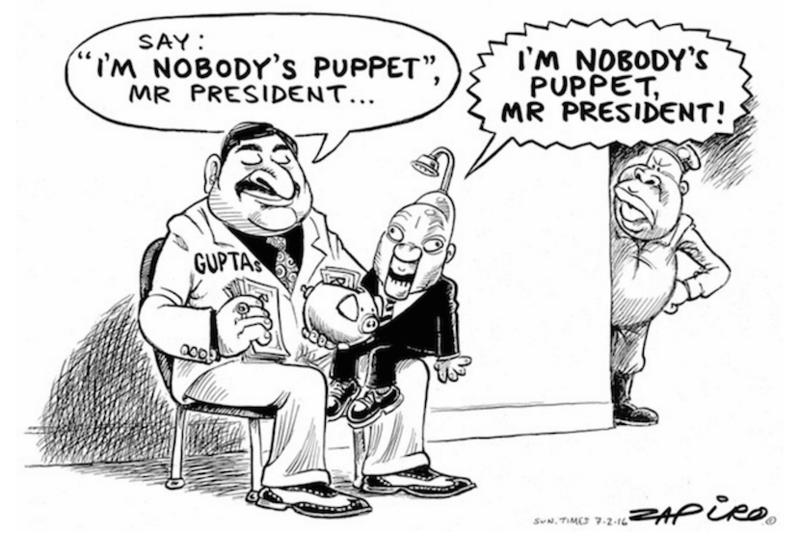 The Guptas have enjoyed relations with politicians for many years. In 2002, two years after Ajay Gupta moved permanently to South Africa, he was appointed to the board of trustees of Brand SA, South Africa’s international promotion agency, a position he retains. Mr Gupta dismisses local media reports suggesting he had links to the mining minister or any influence in Mr Van Rooyen’s four-day stint as finance minister. “Maybe I saw him at one or two places, but I don’t have any relationship at all,” Mr Gupta says of Mr Van Rooyen. The family also denied a claim, made to the FT, that weeks before Mr Van Rooyen’s appointment they had asked Mcebisi Jonas, deputy finance minister, if he was interested in the Treasury’s top post at a meeting at the Gupta home. 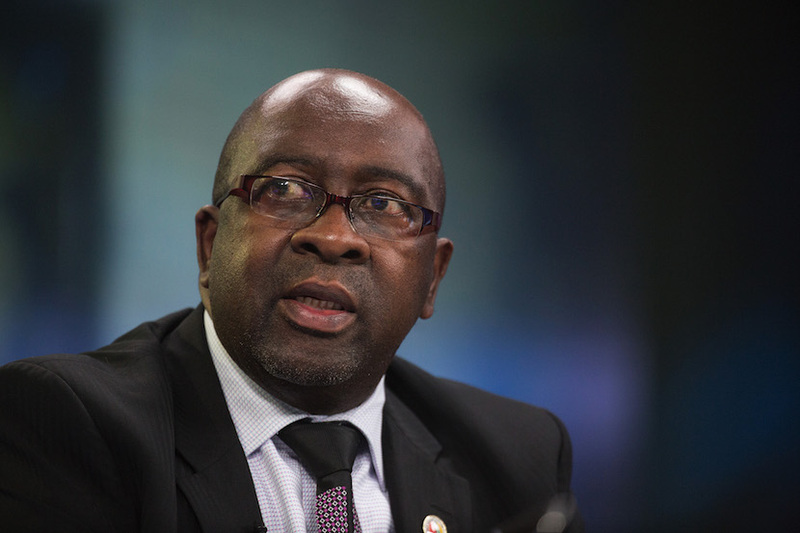 The Treasury and Mr Jonas declined to comment, neither denying nor confirming the existence of the meeting. The family first met the president, who has been a guest at their Johannesburg home, in the early 2000s. One of his daughters was a director at Sahara Computers, and one of his wives worked at the Guptas’ JIC Mining Services. Other senior officials appear less enamoured of the family than Mr Zuma. Last month, Mr Gordhan, the finance minister, chose not to take part in a breakfast with business leaders under the banner of the Guptas’ New Age media group. His decision was interpreted as a pointed message that he did not want to be associated with the family’s interests. While the focus has been on the Guptas, commentators say that should not deflect from the depth of the cronyism and corruption blighting South Africa. Kgalema Motlanthe, who served as Mr Zuma’s deputy from 2009 to 2014, says the ANC should put its foot down. But the omens are not good.